Part I. Intellectual History: 1. Idealist philosophy, culture and the Gladstones; 2. The passion of liberalism; 3. The Victorian salon; 4. Music and the Gladstone salon; Part II. Musical and Literary Case Studies: 5. Mary Gladstone's diary and the Royal College of Music; 6. ‘there ought to be some melody in poetry': Tennyson's salon readings; 7. ‘musical, I see! ': Triangulated listening and Daniel Deronda; 8. Conclusion. 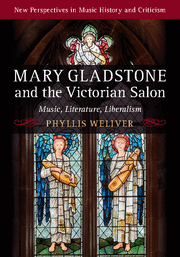 Phyllis Weliver is a Professor of English at Saint Louis University and a Fellow of Gladstone’s Library in Wales. Her research explores literature and music in Victorian Britain as mutually constitutive with a range of nineteenth-century discourses, including constructions of gender, class, childhood, ethnicity, and political and religious identity.